By some estimates, offset lithography represents approximately two-thirds of all print today. Even with the rapid growth of digital printing, the oil and water based process, that also transfers the image to the paper with rubber blankets, is still by far the most dominant form of print media production. When separated from its offset component, lithography (which means stone printing) has been in existence for 213 years and counting. It is distinct from its relief, gravure, screen, xerographic and ink jet cousins in that the ink-carrying print image area is chemically separated from the non-image area. It is this quality—both the positive and negative image are on the same flat surface—that places lithography in a category of printing technology called planography. Although offset lithography is print’s premiere technology (in terms of versatility and volume), it has only occupied this position since 1950 or just over 60 years. The previous dominant technology—letterpress—held that position for 500 years. Gutenberg invented the molten metal type casting and mechanical relief printing process in 1450. We are fortunate that the inventor of lithography, Alois Senefelder, left behind a book with many details of his life, an explanation of how his discovery was made and the methods for its effective use. 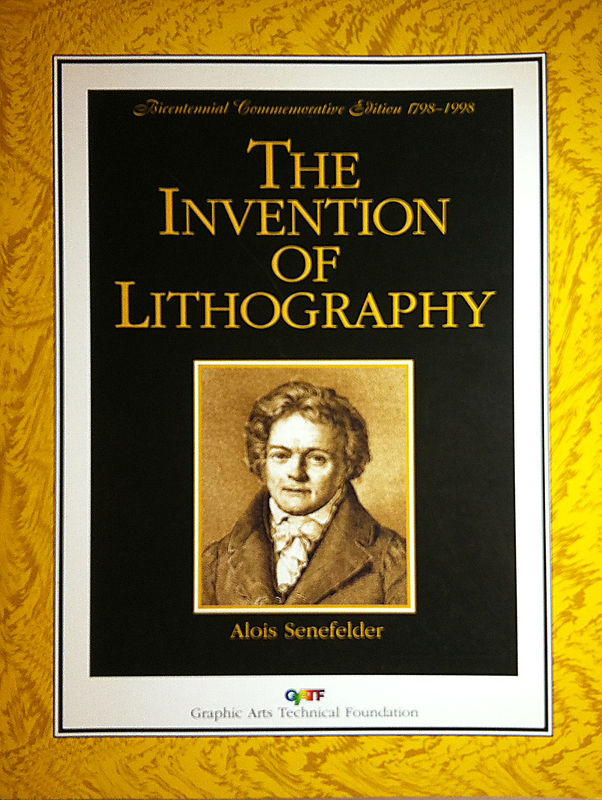 The original translation of this volume, “The Invention of Lithography,” into English was made in 1911 and the Graphic Arts Technical Foundation reprinted it on the bicentennial of Senefelder’s accomplishment. Alois Senefelder was born on November 6, 1771 in Prague where his actor father was appearing on stage at the time. The family lived in Munich and this is where the young Alois attended school. He later won a scholarship to study law in the Bavarian city of Ingolstadt. At the age of twenty, Senefelder’s father died and the young man left his studies at law school to support his mother and eight siblings. His interest in the theater and acting led him to writing plays as a way of earning money. Several plays that he had written as a teenager had received popular response. Initially, Alois went to a local printer with his manuscripts to get his work published. He quickly learned that his supplier had difficulty meeting deadlines and he decided to move the work elsewhere. By the time his copies were available and bought by a bookseller, Senefelder discovered that his costs were barely covered. Being ambitious, Senefelder decided, “I found that it would not be hard for me to learn, and could not withstand the desire to own a small printing establishment myself.” Lacking the resources to buy a printing press, the types and paper, Senefelder engaged in various experiments with different etching and stereotype casting techniques. When he was a student Senefelder had studied chemistry. He was deliberate in his experimentation and tried many different methods of engraving using turpentine, wax and tallow soap as well as copper and zinc surfaces. He also worked with different ink formulas to get his image transferred effectively onto the paper. He began working with stone initially for the purpose of “rubbing down my colors on it” and later to practice writing. Most of the methods he was experimenting with required that writing be done in reverse. It was at this time in 1796 that his discovery was made when he wrote a laundry list on a stone that he had prepared and found that the image could be inked and transferred to paper. By 1798, the full process had been perfected and, on September 3, 1799, Senefelder was granted an exclusive license for it. He joined with the André family of music publishers and refined both the chemical processes and the special form of printing press required for using the lithographic stones. Senefelder called it “stone printing” or “chemical printing,” but the French name lithography became more widely adopted. Senefelder was recognized by King Maximilian Joseph of Bavaria and provided with a pension. A statue of Senefelder stands in the town of Solnhofen, where lithographic stone is still quarried. 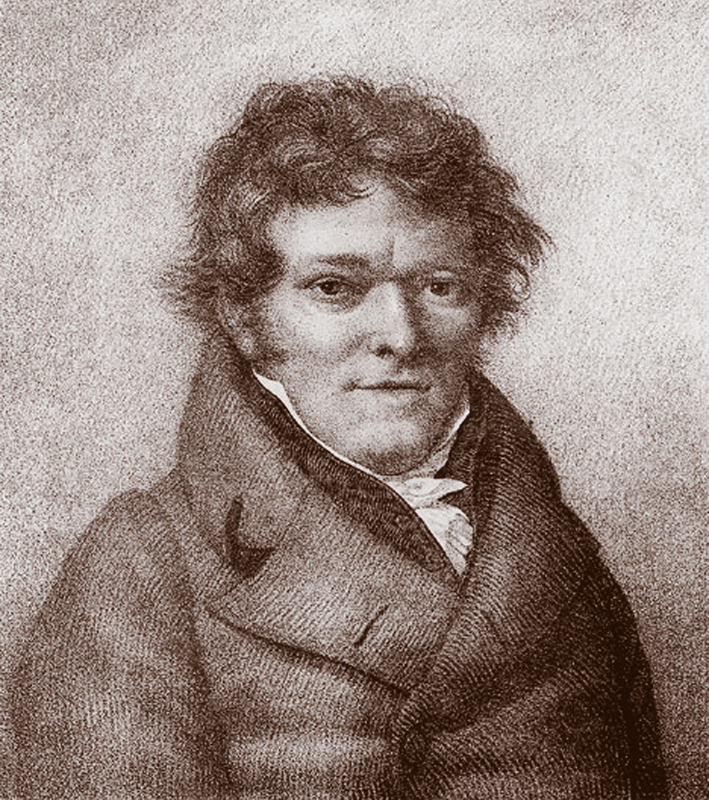 Alois Senefelder’s contribution to printing was significant in that it was a process that was more affordable and could be more widely used. Although letterpress remained the dominant form of printing text, lithography became the preferred technique for art and graphic image reproduction. It would be much later, after the offset printing technique was added to the process, that lithography would come to dominate in the field of newspaper, book and magazine publishing and numerous types of commercial print. This entry was posted on October 18, 2011 at 8:44 am and is filed under People in Media History, Print Media with tags Alois Senefelder, lithography, stone printing. You can follow any responses to this entry through the RSS 2.0 feed. You can leave a response, or trackback from your own site. 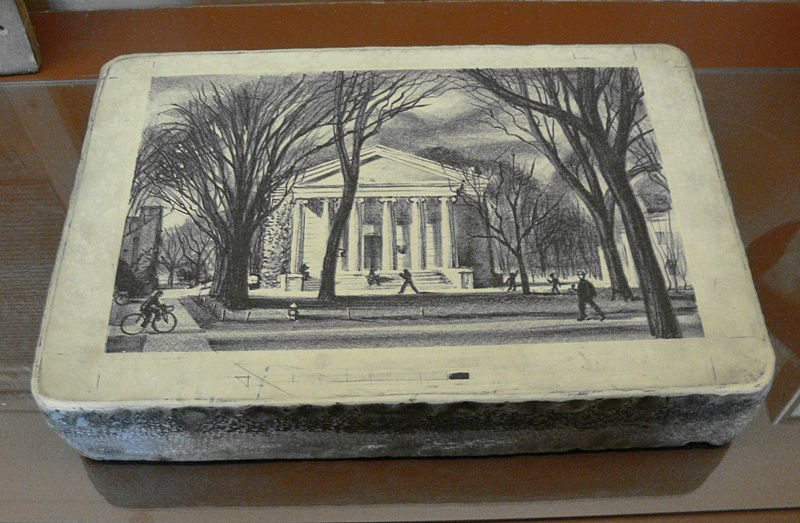 Lithography is an amazing process. I have been printing for years. The stone process carries you close to religion. Reblogged this on Trusting the Process: Getting There From Here.